Yemeni Children Die. The Media Doesn't Cry. The Saudis dropped a 500-pound MK-82 bomb on a school bus, killing 54 Yemeni children and injuring dozens who were riding a school bus this past week. The murder of these innocent beings has justice-minded people demanding an end to the U.S.-funded Saudi war on this poor country. Yemen holds a strategic position at the junction of the Red Sea and the Indian Ocean. What is sad is this violation of U.S. and international laws has received so little media coverage. Over the past three years, the Saudi government has attacked civilians at weddings, funerals, schools and hospitals—and the U.S. media has barely spoken up. Why would it? As mouthpieces for the ruling class, it turns away from the injustice and distracts people with the fake news of Russiagate. In the Mediterranean region, refugees were recently denied entry into Italy. The migrant situation has taken a turn, with neocolonial powers such as Spain, Britain, Italy and Portugal refusing to accept refugees. This further traumatizes the hundreds of thousands of poor people who have already tried to escape European neocolonialism on the African continent, scraping together enough money to find their way across the continent, making the dangerous journey through the Sahara Desert, then being stranded on a boat because it is not allowed to disembark at the shores of these criminal states that are responsible for the misery. Africans leave because their home countries cooperate with the United States. In a piece about NATO being a protection racket, Ann Garrison writes, “Wikileaks provides a wealth of primary source material about Africa and every other corner of the world as seen through the eye of the empire and its vassals and opponents.” Strangely enough, the so-called left in the United States has swung in favor of NATO, all because Trump has spoken out against NATO. But BAP National Organizer Ajamu Baraka says, “The responsibility of the left is to build on Trump’s anti-NATO remarks—whatever his motivations—by offering a real critique of NATO.” Read Ajamu’s latest piece on warmongering by both Republicans and Democrats. More strange things are coming out of Washington in its push to overthrow the Bolivarian state of Venezuela. Now the United States says Brazil—a country it has helped turn right-wing—should “lead the solution to Venezuela”. If this sounds a little out there, consider the United States had announced years ago it intended to conduct “unconventional warfare” in its quest to disrupt people’s movements in Latin America. 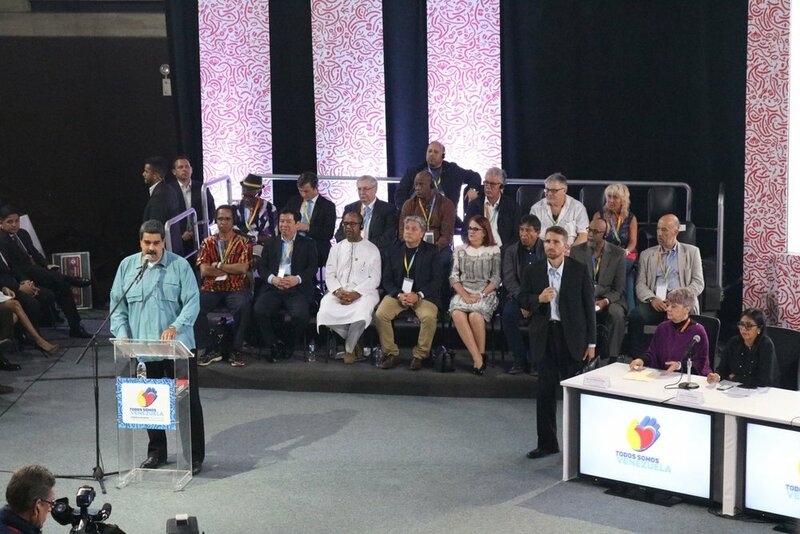 BAP Coordinating Committee member Margaret Kimberley writes, “Anyone who claims to be anti-war must also oppose the ongoing horrors visited upon the Venezuelan people. They are suffering and dying because of decisions made by the bipartisan war party.” Read more of her take on the U.S. war being waged on Venezuela. Last week, we told you about how Alex Jones being shut down on internet platforms was actually the start of the latest censorship move aimed at the left. In case you didn’t hear, both Venezuelanalysis.com and Telesur were recently censored by Facebook. Folks, the state may be coming for BAP soon. That’s why we need all of the support we can get. We’re organizing our first membership meeting for September 21-22 in Atlanta. Only you can help us raise $10,000 to beat back this empire. This Saturday in Baltimore: Join BAP, member organizations Friends of the Congo and Pan African Community Action (PACA), and other prominent Black activists for a panel discussion about the militarization of Black communities and the impact of AFRICOM on Black folks. This event is happening in the same city where news just broke about a Black Baltimore police officer punching a man. Color doesn’t matter because all police officers are tools of the repressive state. Consider attending the Coalition Against U.S. Foreign Military Bases’ First Annual International Conference Against U.S./NATO Military Bases in November in Dublin, Ireland. During this historic week, we remained in solidarity with the oppressed people of Gaza, who so valiantly resisted Israel’s U.S.-subsidized military might to re-claim their right of return to their homeland. Although they weren’t able to pass through the fence and fend off Israeli snipers, their noble efforts to do so once again revealed the reality of the Israeli settler-colonial project. The Black Alliance for Peace says the United States is just as complicit in the murders of more than 50 Palestinians during the 70th anniversary of the Nakba. “The systematic violence of ethnic cleansing, house demolitions, exile, assassinations, land thefts, bombings, and the denial of water and other vital services that provide basic dignity could not have occurred without ongoing support from the United States, as well as both major political parties in the United States, the corporate press and every major institution of U.S. society, including many churches.” Read our complete statement. We also say the United States has no one to blame but itself for the Democratic People’s Republic of Korea (DPRK) refusing to now meet with the Republic of Korea (RoK). Why, you ask? Because the United States continues to arrogantly pursue its goal of conducting joint military exercises with the vassal state of RoK, right on its border with the DPRK. Imagine a so-called “war game” against you happening right outside your house. That’s what is being done here. Read our complete statement on this matter. This is your last chance to register for the National Assembly for Black Liberation, being held May 18-20 in Durham, North Carolina. A delegation of a dozen radical Black activists from BAP will attend. If successful, this historic gathering will unify and strengthen the Black left in the United States. BAP is introducing a resolution at the assembly to include anti-militarism and anti-imperialism as part of the reinvigorated effort’s demands. We have already raised close to $1,000 toward partial support for our delegation. But we really need $3,000 to be able to provide partial support to these BAP members. P.S. We’re sending 12 radical Black activists to the National Assembly for Black Liberation. Help us re-build the Black anti-war movement in the tradition of Black internationalism by contributing today. In pulling the United States out of the Iran deal, we can say the only ones happy are the neocons, liberal interventionists, Israel and Saudi Arabia. This is a clear move toward war. After President Donald Trump’s irresponsible announcement, revealing the United States again cannot be trusted to keep its word, he took it further and threatened Iran not to build nuclear weapons. Saudi Arabia renewed its threat that it would build a bomb if Iran did so. Meanwhile, Israel attacked Iranian positions in Syria as the world reeled from Trump’s immature move. At the Black Alliance for Peace (BAP), we remain steadfast internationalists. We will continue to defend the right of oppressed peoples and states under attack by U.S. imperialism. It is not our place to get into the weeds and critique other states’ business. It is for us to stand to dismantle the U.S. empire. May Day just passed, and we will continue to stress workers of the world must include anti-militarism and anti-imperialism in their demands. It might sound cliché to say we are living in dangerous times. But with the Iran deal ripped up and Korean peace and re-unification in jeopardy as the U.S. empire insists on keeping its military bases on the peninsula, it is up to the workers to take down this oppressive global structure. We also wanted to bring your attention to our friend, former CIA agent-turned-activist Ray McGovern, who was brutalized while being arrested for protesting at the U.S. Senate hearing of Gina Haspel. Haspel had authorized the black site in Thailand where CIA detainees from the around the world had been tortured. The United States being in such a weak geopolitical position has decided to let its civilized mask fall and is now unleashing every weapon against humanity. BAP National Organizer Ajamu Baraka also spoke with progressive journalist Tim Black about the dangerous game the United States is playing around the world and how the struggles of the African diaspora around the world and on the continent are connected to the struggles of Blacks in the United States. As you’ve seen in previous weekly updates, BAP is preparing to send a delegation of a dozen radical Black activists to Durham, North Carolina, to attend the National Assembly for Black Liberation, being held May 18-20. If successful, this historic gathering will unify and strengthen left Black forces in the United States. BAP is introducing a resolution at the assembly to include anti-militarism and anti-imperialism as part of the reinvigorated effort’s demands. We must raise $3,000 to be able to provide partial support to these BAP members. Can we count on you to help re-build the Black anti-war movement? Workers from around the world took to the streets on May 1—International Workers’ Day, also known as May Day—to proclaim on their day they were not going to surrender to the logic of capitalist dehumanization and plunder that the ruling class imposes on the peoples of the world. Read our May Day statement here. Imperialist wars abroad are linked to capitalist-induced class repression on the stolen, occupied land called the United States. On May Day in 2008, the International Longshore and Warehouse Union (ILWU) proved labor strikes can stop these attacks on humanity. The people of the U.S. colony of Puerto Rico have suffered since September due to a lack of electricity that is a direct consequence of colonial destruction and austerity measures. On May Day, they faced further violence at the hands of goons who work for the colonial overseer when Puerto Ricans rightfully expressed their indignation in the streets. In France, the neoliberal policies of President Emmanuel Macron sparked massive demonstrations on May 1. Thousands of workers poured into the streets in opposition to his support for an even more militarized agenda than what his predecessors had proposed. This includes a plan to re-introduce a military draft. Meanwhile, people in the Cuban socialist state 90 miles from the U.S. imperial core say they don’t need to demand their rights as workers because they already have them in place. Afro-Colombians fear for the lives of two leaders of the Black Communities Process, or PCN, the main organization defending the collective land rights of descendants of African slaves. Sara Quiñonez and her mother, Tulia Maris Valencia, were detained on false charges of collaborating with the ELN guerilla group—an allegation that could mark them for assassination. But the PCN is an organization that “promotes peace and peaceful struggle,” said PCN organizer and BAP member Charo Mina-Rojas, who called on leftists everywhere to demand the two women’s release during an interview with BAP member Glen Ford on Black Agenda Report Radio. You can find information on how you can support these two freedom fighters here. War, revolution and organizing the Black left is on the agenda for the National Assembly for Black Liberation. We encourage Black left forces to participate. Information on the conference can be found here. The United States led forces including the United Kingdom and France to attack Syria in pre-dawn hours Saturday over what they say is a chemical-weapons attack. This brought out activists and organizers of many stripes over the past weekend, including Black Alliance for Peace (BAP) members. And we were clear: Not one drop of blood from the working class and poor in defense of the gangsterism of the capitalist ruling class. Watch videos of their talks. Check out photos from the day. BAP had also released a statement last week before the attack took place. State sanctioned violence in the colonized Black and Brown zones of non-being by the domestic military force referred to as "the police" and state violence in the form of interventions, proxy wars, sanctions, destabilization campaigns and support for anti-democratic brutal regimes in Israel, Saudi Arabia and Honduras, are two sides of the same white supremacist colonial/capitalist coin. The objective is the same—maintain the dominance of the oppressive Western imperial project against all challenges, both foreign and domestic. Young people who formed a new group in Baltimore called Youth Against War and Fascism recently blocked the entrance of a CIA recruiting event at Johns Hopkins University. It’s vitally important we keep the police, military and state agents out of our schools. What’s normally left out of the bio circulated about physicist Albert Einstein was that he was tracked by the FBI because of his political views. If you’re in New York City, you can hear Ajamu speak about the foreword he wrote about McCarthyism—past and current—for author Fred Jerome’s new book, “The Einstein File: The FBI’s Secret War Against the World’s Most Famous Scientist”. Get details and RSVP for tonight’s event. BAP member organization Pan-African Community Action and other organizations will host a screening of the film, “Black Cop,” and lead a discussion afterward. RSVP for this April 23 Washington, D.C. event. Join us in taking a conscious step to unite the battlefronts of the Black working class into a national movement for Black liberation and radical transformation of the capitalist system—a system that oppresses and exploits multitudes throughout the world and threatens the sustainability of the Earth. Register for the National Assembly for Black Liberation, May 18-20 in Durham, North Carolina. P.S. Only your support can help beat the U.S. war machine. What power has given the U.S. gangster state the right to unilaterally attack any nation on this planet? The Black Alliance for Peace (BAP) answered that question in a statement we released Tuesday. That some who call themselves radicals can remain silent about the consequences of a possible U.S. military intervention into Syria is a reflection of the bankruptcy of the imperial left that continues to collaborate with the Western and U.S. white supremacist, colonial/capitalist patriarchy. The children of Yemen have been starving and the U.S.-supported apartheid state of Israel murdered two dozen Palestinians. Yet, we heard nothing in response from the ruling class and its collaborators in the corporate media. We are now supposed to believe the racist Trump administration is so committed to Syrian Arab life that it feels morally compelled to intervene. Do you see the obscenity? Some Westerners apparently don’t, hence the race to war. We would laugh, but this is a matter of life and death. And we’re on the side of justice. That’s why we don’t accept the imperialist nonsense coming out corporate-media outlets. In fact, warmongering Democrats are on a quest to start World War III, using former U.S. Secretary of State Madeleine Albright’s book tour to rationalize “humanitarian intervention.” Thankfully, a few anti-imperialists who organize in the center of the empire made sure she would not get to spread that propaganda in peace. Check out the five times Albright was disrupted during her New York City event on Tuesday. It warms our hearts that a few brave humans continue to speak out under the weight of imperial propaganda. The sentiment seems to be spreading beyond political circles. More than 3,000 Google employees demanded the technology company cease its drone project for the Pentagon. Although Spring Actions are occurring across the United States, BAP National Organizer Ajamu Baraka can only be in one place at one time. Catch him at the New York City demonstration, which will include a march to Trump Tower. We say not one drop of working-class blood for the capitalist oligarchy! Did you know physicist Albert Einstein was tracked by the FBI because of his political views? If you’re in New York City, you can hear Ajamu speak about the foreward he wrote about McCarthyism—past and current—for the new book, “The Einstein File: The FBI’s Secret War Against the World’s Most Famous Scientist”. Get details and RSVP for the April 19 event. LeftRoots Cadres & Compas will report back on a recent delegation that went to Vietnam. Register for this April 19 event that takes place online. Join us in taking a conscious step to unite the battlefronts of the Black working class into a national movement for Black liberation and radical transformation of the capitalist system—a system that oppresses and exploits multitudes throughout the world and threatens the sustainability of the Earth. Register today for the National Assembly for Black Liberation, May 18-20 in Durham, North Carolina. P.S. The oppressors won’t dismantle the U.S. war machine—that’s our job. April 4 marks 50 years since the Rev. Dr. Martin Luther King, Jr., was assassinated. The Black Alliance for Peace also launched last year on the 50th anniversary of his 1967 Riverside Church speech. It was then that Dr. King announced his opposition to the Vietnam War, connecting it to the domestic war on Black and poor peoples. Similarly, we at BAP say we are doing this work because we have no other choice as we see our kinfolk murdered domestically and in Africa, while other oppressed peoples bear unimaginable burdens. In honor of Dr. King’s call to defend oppressed peoples, we invite you to join us in demonstrating against war and against the empire April 14-15. Spring Actions will be held nationwide. If you are part of a group, we invite you to endorse and organize events. If you’re in or near New York City, you’ll see BAP National Organizer Ajamu Baraka speaking at that demonstration, which includes a march to Trump Tower. “The Black liberation movement is still fragmented in various alignments whose programs and demands have much in common,” according to the Labor Fightback Network Steering Committee. To build toward unity, the National Assembly for Black Liberation will be held May 18-20 at North Carolina Central University in Durham. There, participants will discuss the Draft Freedom Manifesto as a unity document, along with resolutions submitted by battlefront committees, so a program of action can be drafted. Register for the National Assembly for Black Liberation. Ajamu will speak at the Black is Back Coalition Electoral School being held April 7-8, in St. Louis, Missouri. The theme is “Can Electoral Politics be a Path Towards Black Self-Determination?” Register today. Consider signing on in your individual organizational capacities to a letter by Proceso de Comunidades Negras (a coalition of Black organizations in Colombia). The letter asks the Geneva-based NGO, UPR-INFO, to allow an Afro-Colombian representative to address a briefing to members of the United Nations Human Rights Council in advance of its UPR review of Colombia. Right now, UPR-INFO has slated someone who is not from the Afro-Colombian community to include talking points on Afro-Colombian issues in their speech. As Black internationalists, we say Afro-Colombians must have the opportunity to speak for themselves about the lack of human rights in Colombia. To sign on, please send an email with your organization's complete name, city and country to advocacy@madre.org.